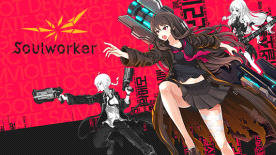 SoulWorker has the moves to impress with rapid combat, real anime feeling and 6 unique characters. Play solo or as part of a 4-man cooperative group – both styles are well served in PvE. The quick yet intense dungeons are teeming with demons, demanding perfect timing and well-placed skill combinations. Experience this post-apocalyptic anime world with impressive cel-shaded graphics and get to grips with the depths of the souls of each unique character. A SoulWorker’s weapon is the window to their soul. The brave Haru Estia heads into battle wielding her mighty Soulum sword, while Lilly Bloommerchen’s expression of her madness takes the form of a destructive Mist Scythe. Scarred by her sorrowful past, young Stella Unibell defends herself from all attacks with the Howling Guitar. Former superstar engineer, Erwin Arclight blasts back enemies making use of his Gun Jazz whilst honorable Jin fights with both fists for justice – yet the shadows of his past constantly weigh on his shoulders. Newest hero Iris Yuma unleashes her innate wrath and the rage at the tragic fate of her family through her gigantic Hammer Stol. © 2015 Lion Games Co., Ltd. Published by Gameforge 4D GmbH. All rights reserved. All trademarks are the property of their respective owners.